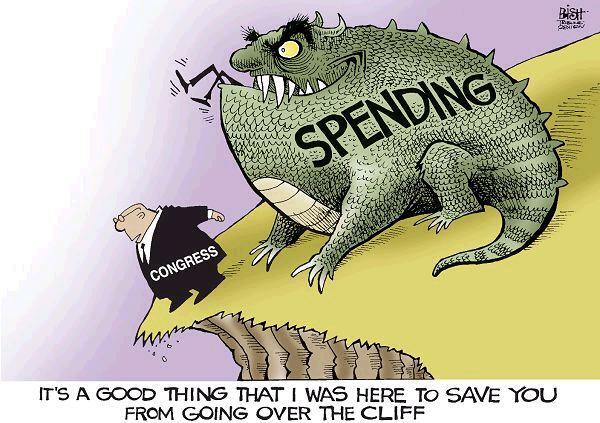 Back in early December, I wrote in the New York Post that the fiscal cliff was just a speed bump and that our real problem was an ever-expanding burden of government spending. Well, I should have waited until this cartoon was published, because it captures in one image what I tried to say in more than 800 words. I’m not familiar with this cartoonist, but he or she deserves kudos for recognizing the problem is spending. Deficits and debt are merely symptoms of the disease of excessive government. Makes me wonder, by the way, whether this monster is related to the one in this classic cartoon from Lisa Benson. P.S. If we want to slay the monster in today’s cartoon, we need to copy the very successful Swiss Debt Brake and restrain the growth of government spending. And to make sure we abide by that cap, we’ll need some sensible entitlement reform.